– EFC-38 is designed to clean wood and will strip older oil based decking stains. 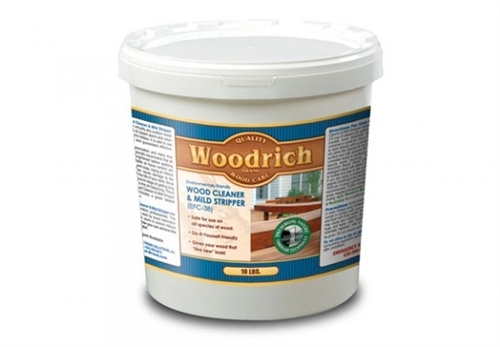 We did not rate it as a stripper since it is not labeled or designed to remove all wood deck stain coatings. – EFC-38 mixes with water at the rate of 6-8 oz per gallon. We mixed the entire 2-pound container in 5 gallons of warm water. The EFC-38 dissolved fairly easy into the water. The product was applied with a pump up sprayer and applied to a fence. Coverage was close to 200 feet per gallon. A pressure washer was used to rinse off the gray wood and dirt. – The fence was restored to like new condition. EFC-38 does need to be neutralized with the Citralic Wood Brightener. It is normal to neutralize wood deck cleaners and the final appearance was excellent for an application of a stain. – EFC-38 is an excellent cleaner for prepping your exterior wood, deck, or fencing. Performs as described and is very cost effective. Highly rated! The condition of Deck: Heavily grayed. Where can I find a good deck cleaner and brightener that I don’t have to get online!!! My husband has already started sanding the deck and will need cleaner and brightener in 2 days!! We just painted our house; the deck is Doug Fir 2 x 6 which is attached to the house. Will this product affect the paint? If so, how long do we have to wait for the paint to cure so it won’t affect the paint? Where can I find this cleaner? Please contact manufacturer directly for this.